Discussion in 'The Sports section' started by KUCIAR666, Nov 8, 2017. The 4.0 km long Circuito de la Comunitat Valenciana - Ricardo Tormo was completed in 1999 and was immediately added to the MotoGP calendar for that same year. The twisty track lay-out (featuring nine left and five right corners and an 876 m longest straight) is challenging for both man and machine, but beloved by many riders as well as the fans. The stadium offers spectators a perfect view of all parts of the circuit from every stand, so they won't miss any of the action as the MotoGP season comes to a close. "I arrive in Valencia in a very positive mood. After the last three races in Asia and Oceania I've spent some time at home, training and relaxing. The Ricardo Tormo Circuit is a track that I really like, it has a lay-out that suits my riding style very well. We expect nice weather for the entire week, so I will try to push and give my 100% to finish the season with a nice podium at the last round. We are already focused on the next season and we also want to work hard during the test next week." "The last race of the season has come. It wasn't an exciting end of the season for us, but during the three races overseas we've got some more data for our bike and we've always been fine on the dry. We hope that there will be good weather in Valencia to work in the best way. We are not fighting for the championship this weekend, but we will try to make it a good race anyway, and we will try to use next week's two-day test to start working on the 2018 season." "After the triple header overseas the team had a few days to catch their breath before the final race of the season. We're all looking forward to the Valencia Grand Prix. The atmosphere at the last round is always special: one season ends and immediately after the next one begins. We're arriving in Spain with the goal to not only end the season with a positive result, but we also want to start working for next year. There's a busy week ahead of us and we are impatient to get started." "It’s already the last Grand Prix of the season and the year has gone quite quickly but very interestingly. I am so happy to go to Valencia with this high level of confidence and a positive feeling from the last few races. I will see what my potential is on Friday and Saturday, yet, if I can be competitive and remain with the top three riders, then I hope to fight for another podium. In fact, why not try and go for the first victory? Let's see, but for sure I want to enjoy the Valencia GP a lot." "It’s a shame that Jonas cannot ride in Valencia, but I am really honoured that Hervé asked me again because I think it showed that I did quite a good job in Sepang. I have not ridden in Valencia for a long time, but hopefully, it will be a little bit easier than the race in Malaysia, now that I know the bike, the tyres and the brakes more. The most important thing is that I hope we have a normal dry weekend, where I can ride a lot of laps and improve myself together with the bike. I just want to make steps forward and close the gap to the front guys plus, just enjoy the occasion because it's an amazing opportunity." "It has already been a year since Johann Zarco and Jonas Folger rode the YZR-M1 for the first time and it feels like yesterday. Not only have we done the winter tests together, but the whole season and now we arrive at the last round of the 2017 campaign. It is exciting yet, also a time to look back at what we have achieved and I think we can be quite proud of what has been done by the Monster Yamaha Tech3 team. Our riders did a great job, although Jonas, unfortunately, could not finish the year with us due to him having to fight a tough illness and we really hope he recovers well. Regarding Johann Zarco, there isn’t much to say that hasn't already been said. Rookie of the Year, Best Independent rider, two podiums, two pole positions, as well as many unbelievable memories. The last time we were here, we tested and it was successful, however, the bike and the rider have certainly improved. I’m certain that Johann will want to finish the season on a high note with another strong performance. I would like also to welcome Michael van der Mark for his second MotoGP event with Monster Yamaha Tech3. We were quite happy to see that he finished 4th in the second WorldSBK race in Qatar and close to the leading group. This is hopefully a sign that he is in good form and I’m sure that this time he will feel more at home on the YZR- M1 and with the Tech3 team, having worked with us in Malaysia. He can go out, have fun and show his true potential. There are a lot of things that will happen during this weekend, and the championship is still to be decided between Marc Marquez and Andrea Dovizioso. Everyone has a good reason to push and finish the year on a high note. 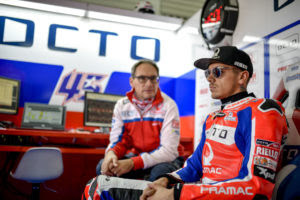 I will say to everyone following MotoGP and our team, come and support us at this last race, which will be the definite end to a great and memorable MotoGP season." 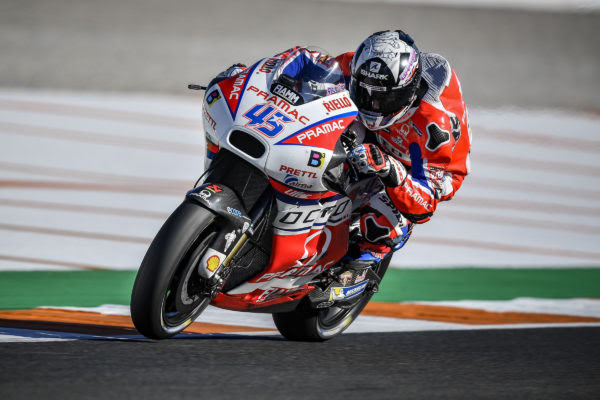 The last weekend of the 2017 MotoGP season will be staged at the Valencia circuit and the Grand Prix de la Comunitat Valenciana will decree the next World Champion with the challenge between Andrea Dovizioso and Marc Marquez who has thrilled fans from all over the world. 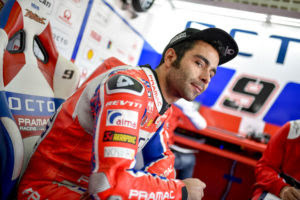 For Octo Pramac Racing it's not an easy Friday, especially for Danilo Petrucci who after the good sensations in the last run of the FP1 did not manage to improve in the afternoon. 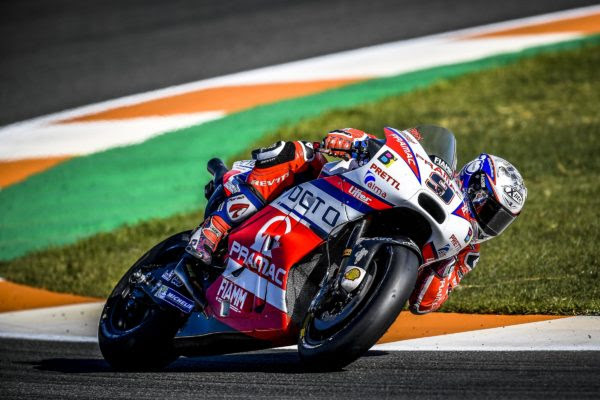 On the other hand, there were positive signals from Scott Redding who managed to take a good step forward during the day to stay close to the Top 10. In FP2 the English rider managed to improve by 8 thents of a second his best time of FP1 and with the chrono of 1'31.733 finished in 14th position, 3 tenths of a second from the hypothetical Q2 direct qualification. Petrux struggled a lot especially in the middle part of the circuit and in the afternoon he was not able to do better than the lap-time of 1'32.029 recorded in the FP1, finishing in 20th position in the overall classification. “It was a very difficult day. The direction we have taken has not yielded the desired results. The positive thing is that we have understood that this is not the right direction, so tomorrow we will try to work on the set up to be more competitive”. “All in all, things have not gone wrong today. I have a good feeling even though I will have to improve a lot in order to win the Q2. I don't want to set myself objectives for tomorrow other than to be the best Ducati satellite in the last qualifying session of the season”. Movistar Yamaha MotoGP's Valentino Rossi and Maverick Viñales slowly turned up the heat at the first free practice sessions of the Gran Premio de la Comunitat Valenciana. As the temperatures rose, the teammates upped their speed to secure 11th and 12th place respectively in the combined free practice timesheets. It was a busy first day at the Circuito de la Comunitat Valenciana - Ricardo Tormo for Rossi. For the nine-time World Champion, the goal in the morning session was to find a solid base setting, one he could develop further throughout the weekend. Whilst working his way through various setting options, he set a time of 1'32.538s to finish in 18th position, 1.493s behind the leader. In the afternoon, the Doctor wasted no time to pick up where he left off in the morning. He was eager to get out on track and briefly led the way, before continuing to fine-tune his bike's setting. As the times dropped towards the end of the session, he responded by bettering his fastest lap to 1'31.488s for ninth, but just missed out on a place inside the top-10 overall. He finished the day in 11th place in the combined results, 0.848s from first. Though the Spanish sunshine gave a false impression of a late summer day, Viñales headed out in FP1 in chilly conditions, curious to find out what the grip level would be like while the track temperature only measured 12ºC. He made a cautious start, but gradually found confidence, all the while improving his time. Ultimately, he dropped under the 1'32s mark on his third run, clocking a 1'31.750s best lap, for sixth place, 0.705s from the front. The afternoon saw more of the same from the local hero. As the temperature went up, he again spent most of the session working on the balance of his YZR-M1, whilst trying a couple of set-up changes during the second 45-minute session. Following his usual routine, he saved the best for his last outing. He was able to improve to a 1'31.624s lap for 11th place, 0.984s from the top of the FP2 ranking, and completed the day in 12th position in the combined times. "It was a difficult day, especially this morning, because I didn't feel good with the bike, but in the afternoon we improved the feeling and the setting. In the end, though I wasn't fantastic, I was also not so bad, my speed was quite good. Here in Valencia it's always difficult, because the grip is very low. During the whole season we suffered a lot in these types of conditions, so we have a lot to work on." "It was a challenging day. We were struggling on the brakes, and trying to make the bike turn in the corners was difficult. It's hard to understand what the situation is, I just try to ride the bike in the best way I can. This was the result and we will try to improve. I think we have the level to reach the top-5. Let's see tomorrow, so far it seems to be quite a difficult weekend." "The first day didn't quite go to plan. Even though we tried different set-ups on both sides of the garage, we haven't been able to improve as much as we wanted to. However, we were still able to compare different tyre specifications and got some good information for when we make the tyre choice for the race. It's really important for tomorrow's session that we find what didn't work today, so we can improve." Johann Zarco kicked off his quest to complete the season finale on the rostrum with a strong showing on the first day of action. The French star improved in both sessions before concluding the afternoon practice in 5th with his best time leaving him only 0.105 back from the top three, and as the leading Yamaha rider. Tomorrow he intends to progress further by sealing a front row start in qualifying. Meanwhile, Michael van der Mark, who is stepping in for the recovering Jonas Folger, used the initial practice sessions to get to grips with the meandering Valencia circuit. The WorldSBK front-runner made leaps forward and wrapped up the day with a time that was almost one and a half seconds quicker than his personal best in the morning. Tomorrow, the action commences at 09:55 with FP3. "I am happy with what we achieved today and I started well, with a good pace. We did some constructive work with the medium tyres, which enabled us to save the soft compound until later. When we used it, I improved my time, but, to be honest, I expected a bit more. However, I am inside the top ten which is the most important thing. I will keep pushing and the information that we collected this afternoon will be useful for qualifying. I am pleased that we had dry and clear weather today and it should be the same for the entire weekend. Anyway, I am enjoying my time here and I hope to stay with the top guys tomorrow in order to prepare for a positive Sunday." "Overall, it was a good first day despite the fact that I had to get used to the bike again, and I haven't raced here for a long time. In the first session I struggled with the feeling a bit, but towards the end, I managed to improve gradually even if the gap to the front was quite big. In FP2 this afternoon, I felt stronger and more comfortable on the bike, then, in the final part of the practice, we put some new tyres on and I made a good step forward. However, it wasn't as big as I wanted, but we can see that we are making real progress. I am enjoying every single lap, and hopefully tomorrow we can adjust the bike a little bit more to my style." The last qualifying session of the 2017 MotoGP season has not given any emotions to the Octo Pramac Racing. 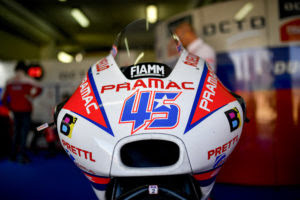 Danilo Petrucci and Scott Redding are unable to solve Friday's problems and have to settle for the fifth and eighth row respectively. 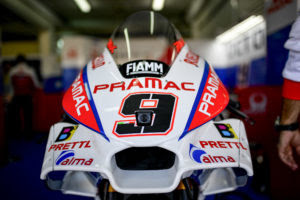 Petrux tries to solve the difficulties of Friday free practice working on the set up and manages to increase his speed. However, the problems cornering the corner speed in the middle of the circuit remain. In Q1 the rider from Terni tried to push but could not find the conditions to conquer the Q2 closing in 15th position. For Scott a very disappointing Saturday. The English rider’s pace is good (13th lap time in FP4s at 2 tenths from fourth place) but a crash at the end of the FP3 reduced his confidence. Scott is not competitive in Q1s and ends up in 22th position. “We had a lot of difficulties this weekend, we changed a lot, we also went back to the set up of the beginning of the season but we didn't manage to take a major step forward. However, I think the Top 10 is possible”. “Tomorrow we will start from the back so we can only improve. If I have to be honest, the race pace is good but it won't be easy to get a good result. It's a very difficult weekend for me”. An incident-packed last Q2 session of the season, held at the Ricardo Tormo Circuit this afternoon, saw Movistar Yamaha MotoGP's Valentino Rossi secure seventh place on the grid for the Gran Premio de la Comunitat Valenciana. His teammate Maverick Viñales took part in Q1 and only just missed out on a place in the top-2, to promote to Q2. He will start tomorrow's race from 13th position. Rossi was impatient to get things going in today's Q2 session. As soon as the pit lane lights went green he dashed out on track aboard his YZR-M1, but he had to hold back due to traffic on his first lap. Once the nine-time World Champion found himself some clear track space, he settled into tenth position. He went on to improve his time on his third try, but didn't better his position and held tenth place as he returned to the pits. The Doctor was back out on track again with five minutes of the shoot-out remaining. Having dropped to 11th place, he put his head down and climbed up to eighth. He gained another position on his fifth attempt. The Italian had one lap remaining after the flag had come out, but he didn't improve on his 1'30.848s and remained in seventh place, 0.951s from pole. He will start the final showdown from the third row of the grid. He was back on his bike with six minutes left on the clock, determined to further improve on his best time. He moved up from seventh to second, posting a 1'31.030s on his fifth full lap, but was pushed back to third as the times dropped in the final minutes. He had one more try left, but was unable to better his lap time and ended the session in third place, 0.137s from first place in Q1. He will start tomorrow's race from 13th place on the grid. "I'm quite happy, because I was able to arrive directly in the Q2 with a tenth place, and after I improved a little bit in the afternoon. In qualifying I was improving my position. It was a good lap and I could have stayed on the second row, but unfortunately I made a mistake in the last corner, I arrived too fast, so I lost time. Anyway, the seventh place is not so bad, considering this weekend and our speed. I think we will do a very hard race tomorrow, because our pace isn't fantastic, but it's just the Saturday, so we need to try to do something for tomorrow and we'll see." "Normally it's difficult to really improve the bike throughout the weekend, so this is not a special scenario. However, this weekend seems to be even more difficult, but that doesn't mean we'll be settling. Anyway, I would like to remain optimistic, that we can find new options that we can test in tomorrow's warm up. In any case, I will do my best as always." "The Valencia Grand Prix is proving to be a challenge for us this year. On a positive note, Valentino seemed to have found something in the free practice sessions that improved his feeling. He was gaining momentum throughout most of the Q2 session. It was a pity that a mistake in the final corner lost him time, but he still secured seventh place on the grid. Maverick wasn't feeling as confident, though he tried many things in the practice sessions. He started the Q1 on the medium rear tyre, hoping that he would have the pace to position himself inside the top-2 without using one of the softer rear tyres, but this turned out to be impossible today. He set a good time on his second run with the softer tyre, but unfortunately it wasn't enough in the end to promote to Q2 and he took 13th position. We know that tomorrow is going to be a tough race for us. After challenging sessions, it's difficult to be confident for the race, but we still believe that we can prepare something for tomorrow." "It was a great qualifying performance. I started quite well with a 1'30.5 lap time, but then it got to the stage where it was tricky to go faster. However, we changed something on the bike, which allowed me to do a 1'30.2. It was not possible to match the pole time today, yet, I think that even though I couldn't do this, I will be able to run a very solid pace in the race tomorrow. Plus, I hope to have a good battle. There will be a lot of riders who will be quick and they all want to win or go for the podium. So I will be ready to fight, and I'll use this second place qualifying result to stay at the front. It will be 30 long laps but I think I can run the pace that I need to and stay focused. In addition, I must keep my energy until the end." "This morning we made some changes on the bike and I started to feel better and better. I was still getting used to the YZR-M1 and I didn't feel totally comfortable on it yet. However, we made steps forward and towards the end of the session, I cut my lap time again, not as much as I wanted to, but I was still happy. In FP4 I tried two different bikes and we found one with a slightly better setup so I was able to run good lap times on used tyres, which was satisfying. In qualifying, I improved again on my first lap, and then, at the end with new tyres, I did the same lap time. I am pleased that I made progress in every session, but I wanted to make bigger steps. We need to find a better riding position for me, and we also have to adjust the bike a bit more for my style and feeling. The team are working really hard and we are advancing every time we go out on the track, which was my goal, but I hope that tomorrow in the race, we can make another step and then fight with some of the guys in front of us."